Comfort Candles are a unique line of attractive candle holders with inspirational sayings. They come packaged inside a beautiful gift box which makes for a wonderful "Gift to Go"! These versatile candles hold a tealight and include a fashionable copper lid. 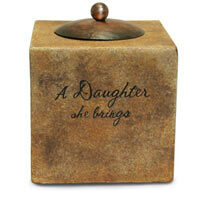 Whether the candle is glowing or the copper lid is on, these items are a true decorative home accessory. The warm coloration and finish on the candles will be perfect for any home.